Waffles are practically an essential brunch item but customers can get bored with the usual toppings. In this recipe, chef Hegsted adds peanut butter to the batter and creates a fresh grape compote for the topping—a brunchy variation on the quintessential peanut butter and jelly sandwich. 1. For grape compote: In small saucepan, combine water, sugar, lemon juice and 1 cup of the grapes. Cook over medium heat for about 10 minutes. Add remaining grapes and cook for an additional 8 minutes, stirring frequently. Keep warm. 2. For waffles: Preheat waffle iron to medium heat. In large bowl, whisk flours, sugar, baking powder, nutmeg and salt together. Mix together vanilla, peanut butter and butter until combined. Make a well in center of dry ingredients and pour in wet ingredients. Whisk together to make a slightly lumpy batter. In seasoned waffle iron, pour and spread about 1 cup batter. Cover and cook until crisp and rich golden brown, about 7 minutes. 3. For grape whipped cream: Place bowl and whisk into freezer. When ready to whisk the cream, pour cream into bowl along with jelly. Whisk until cream reaches stiff peaks. Cover and place into refrigerator until ready to use. 4. 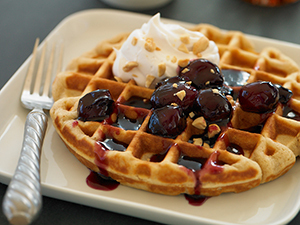 To serve, place a waffle onto plate and top with 1/2 cup warm grape compote, 1 tablespoon chopped peanuts and 2 tablespoons grape whipped cream. Garnish with chopped peanuts.